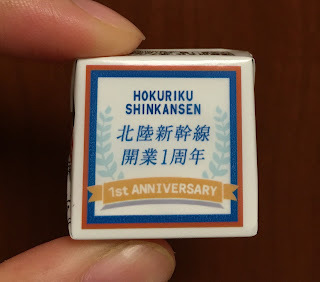 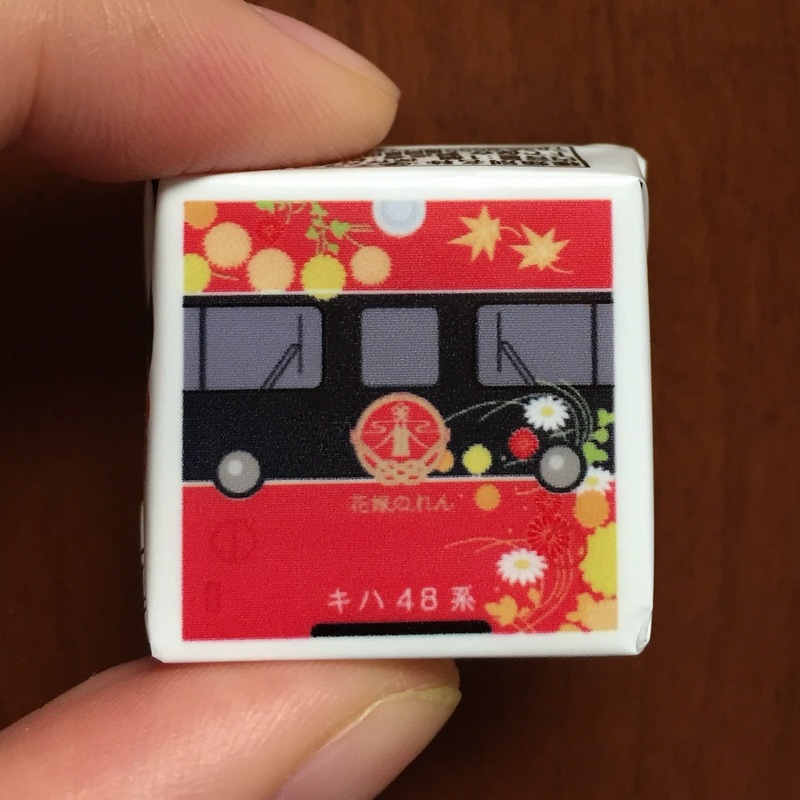 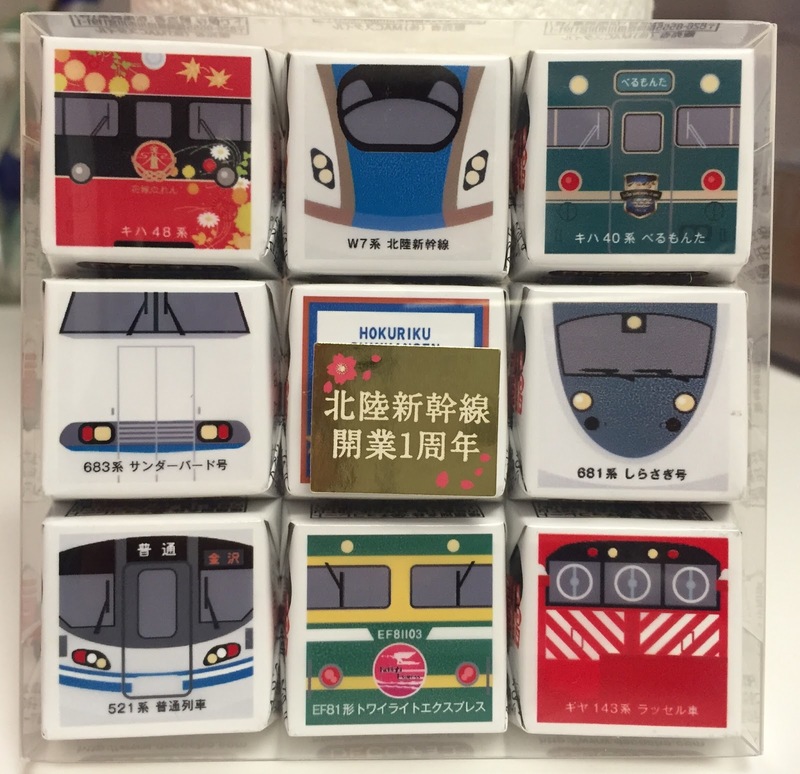 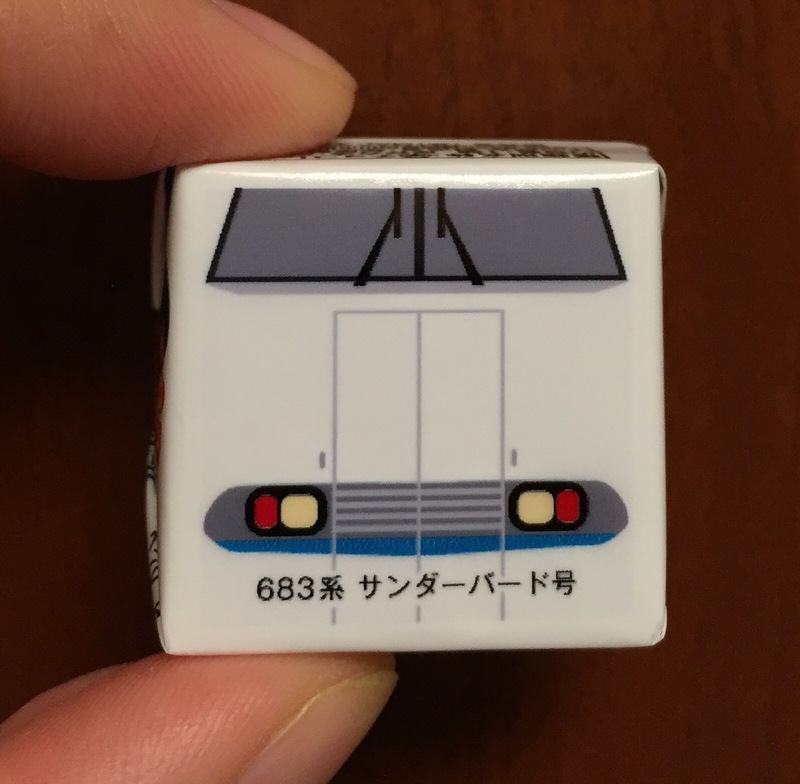 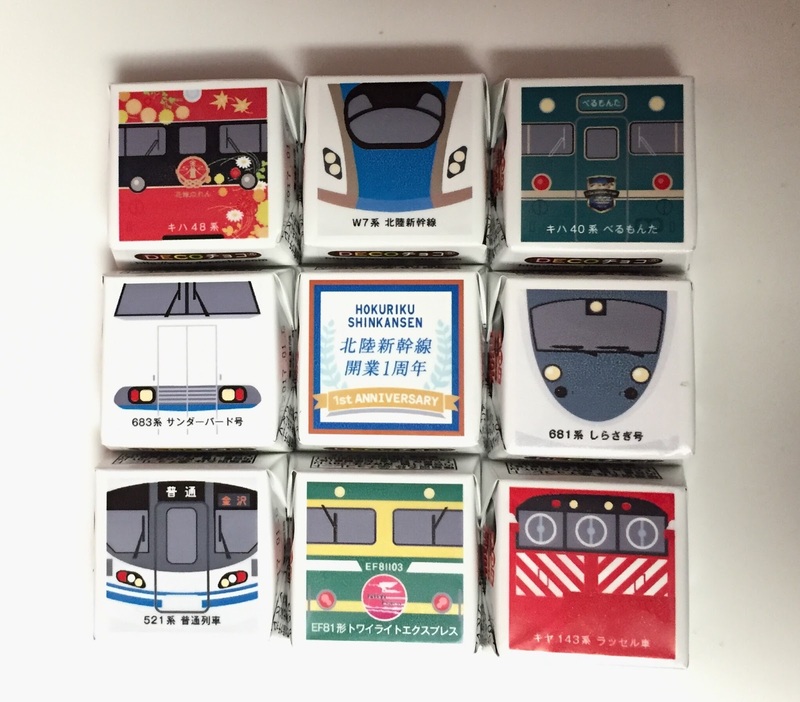 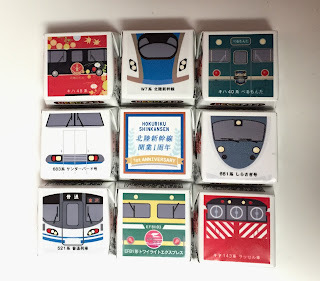 My mom gave me a special Tirol-Choco produced to celebrate the 1st anniversary of Hokuriku Shinkansen. Tirol-Choco is a mini square chocolates and has so many flavors, and you can find them at pretty much any conbini and supermarkets. 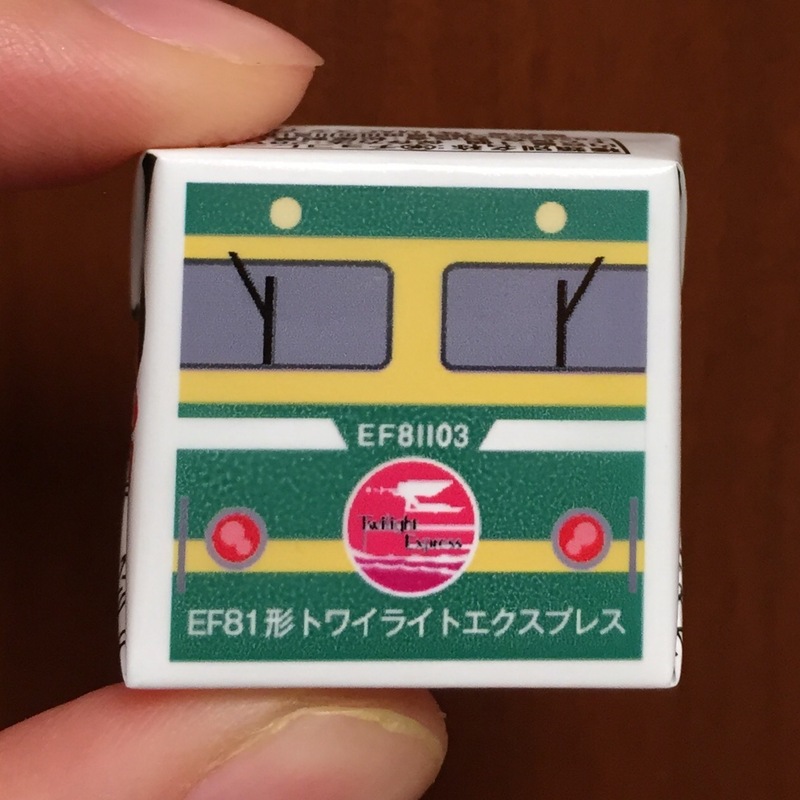 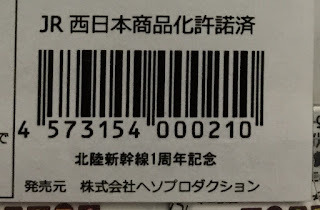 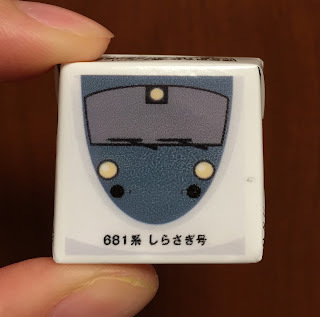 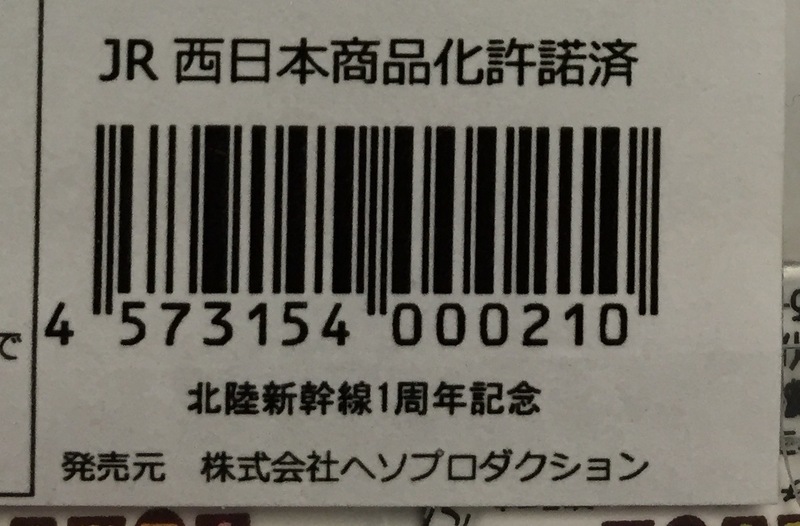 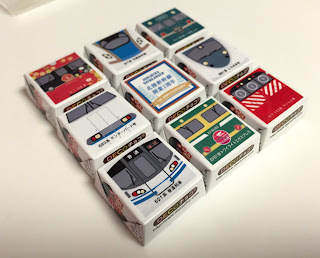 Hokuriku area is operated by JR West, and the box sure said that it's licensed by the rail company. 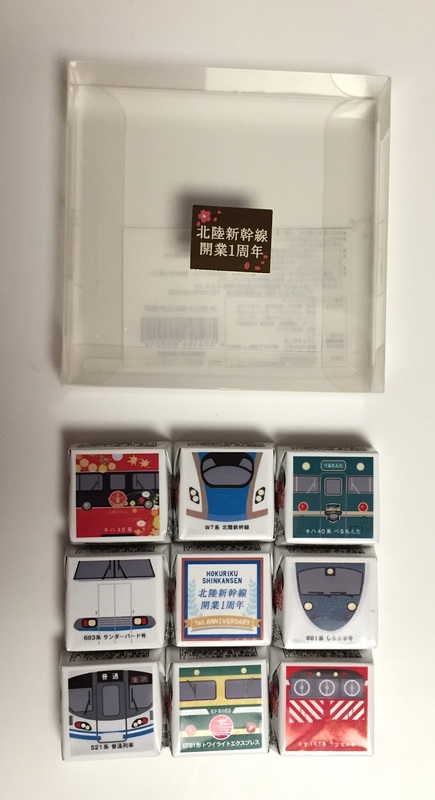 The plastic case holds 9 pieces of Tirol-Choco and in the middle, it says "Hokuriku Shinkansen 1st Anniversary (北陸新幹線開業1周年)" on the gold sticker with Sakura flowers. Each Tirol-Choco had different faces with descriptions of trains and forms. From the color of the body and the destination says Kanazawa, I believe this is the one I used to take to go to school called Hokuriku Honsen, which is now called Ainokaze Toyama Tetsudo. It was a special limited express sleeping car train service between Osaka and Sapporo, but no longer it's running. It's a train to clear snow on the rail tracks. 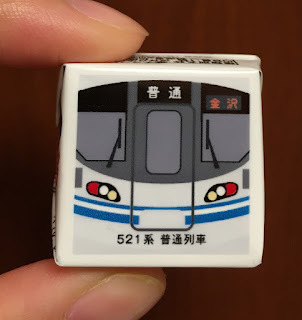 It's a limited express train between Osaka and Kanazawa, and some stops at Wakura Onsen, a hot spring in Nanao city, Ishikawa. It's a limited express runs between Nagoya and Kanazawa. In the middle, it says, "Hanayome Noren (花嫁のれん, Bride Curtain)," and it's a sightseeing train on Nanao line (between Kanazawa and Wakura Onsen) started on October 3, 2015. Depends on the cars, you can enjoy Japanese Light Meal Set (2nd car), Sweets Set (1st and 3rd car) and Horoyoi (meaning tipsy, slightly drunk) Set (4th car). 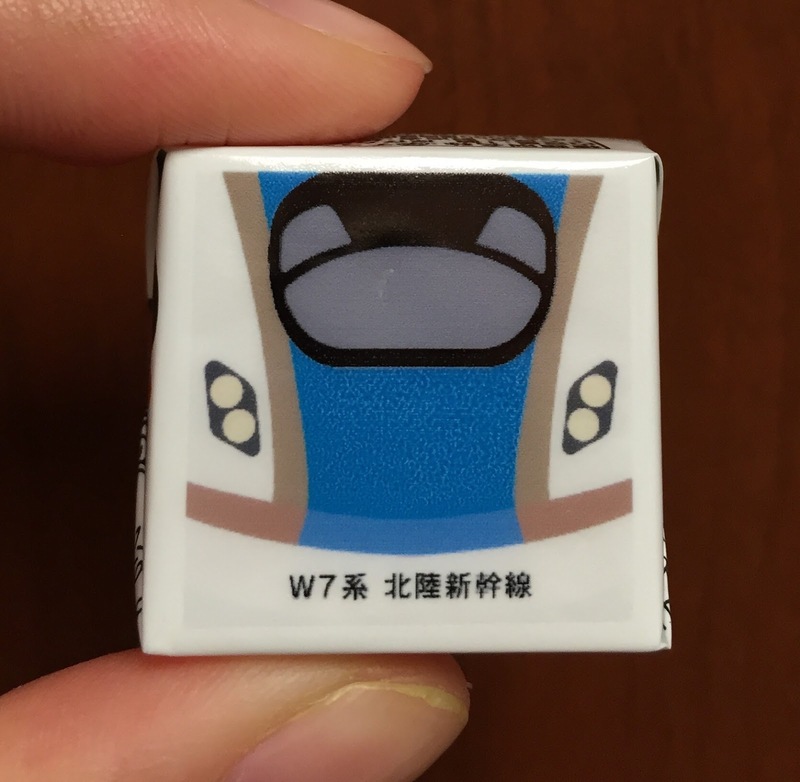 It runs Saturdays, Sundays and holidays, but the schedule changes by seasons. 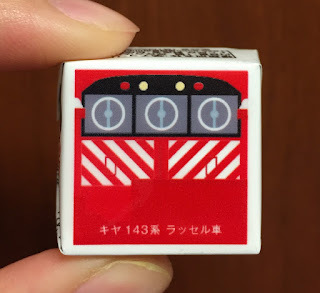 It's a bullet train opened on March 14, 2015 between Tokyo and Kanazawa. 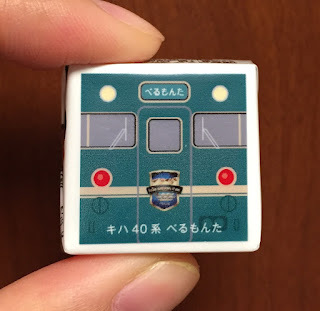 Berumonta is a nickname of "Belles Montagnes et Mer" meaning beautiful mountains and ocean, and it's a sightseeing train between Shin-Takaoka and Himi (pattern A) or Takaoka and Johana (pattern B). It opened on October 10, 2015 and only operates on weekends. All the chocolate had "Tirol with heavy cream Milk" on the side, I learned that the all the chocolates were same flavor. 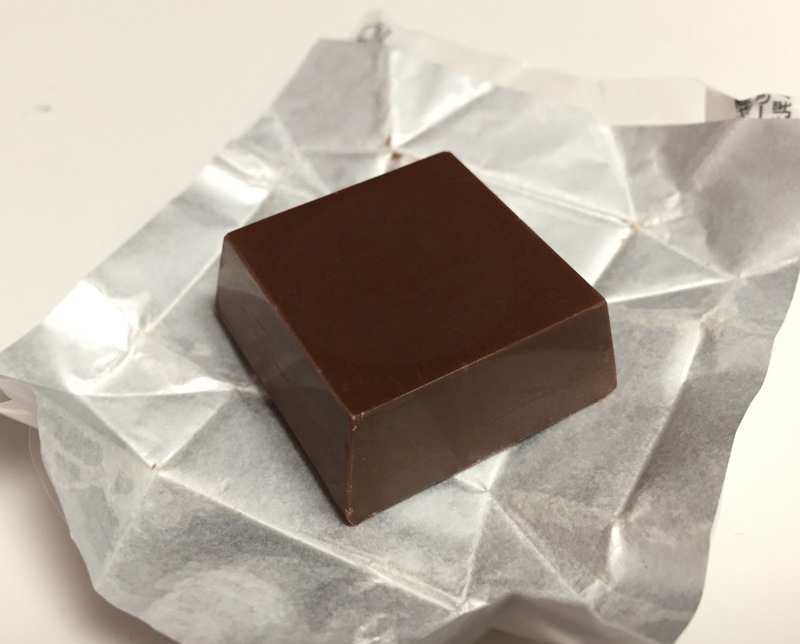 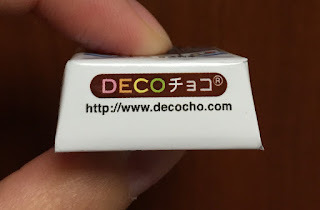 DECOチョコ (DECO Choco) is a site where you can make your own Tirol Choco with photos and stamps. 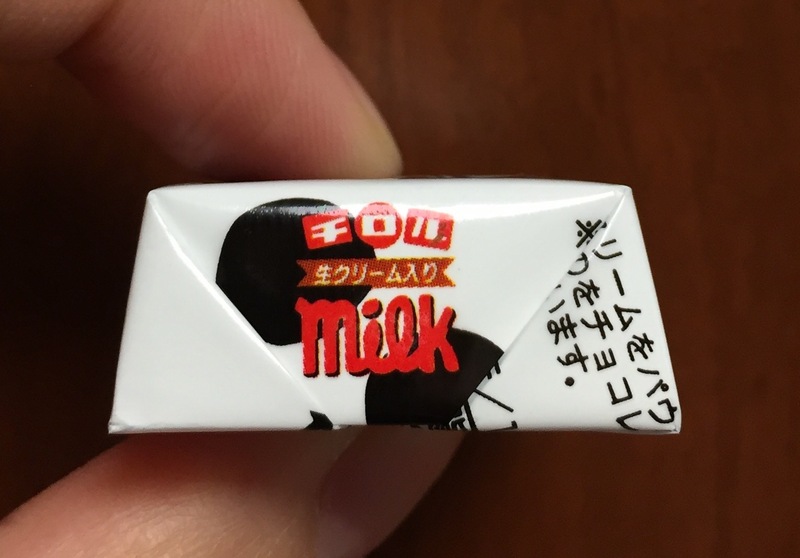 Tirol-Choco Milk is one of the classic and long-selling flavor, and the outside was a plain milk chocolate. 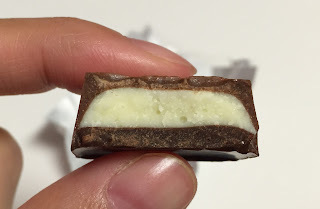 In the middle, there's sweet filling with heavy cream.